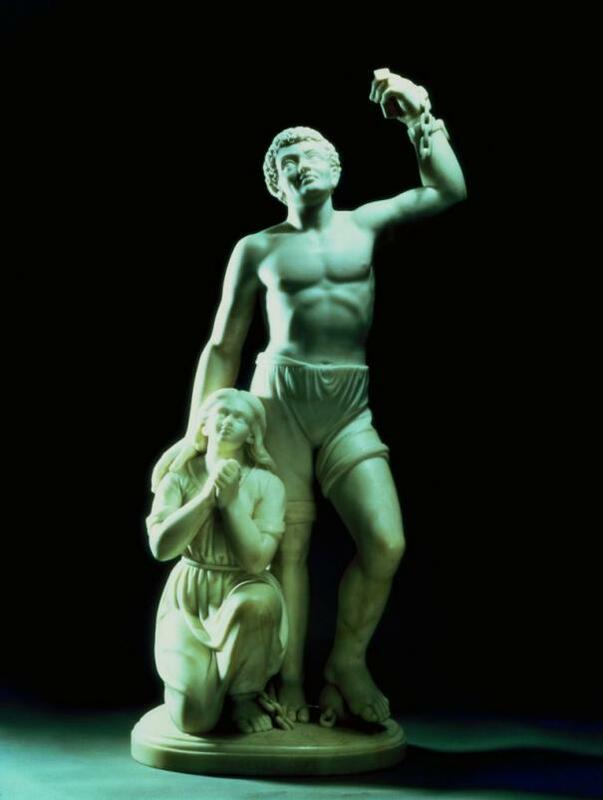 “…it was not until Edmonia Lewis’s sculpture Forever Free in 1867, that a Black subject but a Black artist was made wholly central, resistant, and emotionally distinct. During this period, Lewis was unique as an activist Black woman sculptor, but also as an artist who defied European conventions. While the sculpture Forever Free observes both a neoclassical and romantic style, the sculpture’s subject matter is both Black and independent. In this way, Lewis disrupts the traditional neoclassical subjects that would have been her academic models…. Lewis also expresses her Black and female consciousness through the image of the subordinate female figure at the side of the male. This figure comments on a Black activist emphasis on Black male suffrage rather than a universal suffrage that would include Black women in the vote after the US Civil War. The conflict about female suffrage was one that divided Black and White activists of both genders. This issue was deeply controversial and divisive in Black activist spheres from the end of the Civil War until the ratification of the Nineteenth Amendment in 1920…. Scholars have not agreed on whether to interpret the image of the young woman as Black. Despite the lack of texture in the woman’s hair, it has been suggested that her features show her to be of African descent, and that she represents the Black wife of the standing male…. Bonnie Claudia Harrison, “Diaspordas: Black Women and the Fine Art of Activism,” Meridians: feminism, race, transnationalism, vol. 2, no. 2 (2002): 171-2.